We’ve had cooler weather as of late, so I’ve been craving more and more soup and stew. After having the hearty goulash soup from the Black Forest Inn upped my cravings for beef soup, specifically one I would consider to be hearty. I already had a large eye of round roast cooking in the slow cooker, so I thought why not use half of that for a soup and slice up the rest for sandwiches? Layer the onions on the bottom of the crockpot with the carrots and celery. Spread the garlic over the vegetables, as well as all other dry seasonings, reserving half of the cumin and paprika. Also add the Knorr’s stock seasoning. Place the roast on top of all of this and the potatoes around the roast, then pour the broth and water into the crockpot. Add the Worcestershire sauce around the roast. Sprinkle the reserved cumin and paprika over the top of the roast. Place the lid on the slow cooker, plug it in and set it on high. Leave it alone for 3-4 hours until the roast is cooked through. Remove the roast and allow to rest for 20 minutes or so. Add the frozen veggies and heat through, turning the slow cooker on low for the last 20-30 minutes while the roast rests and you cube 1/2 of it. Add the cubed beef, stir thoroughly and serve hot. If eating soup on its own (2 cups is a good serving), serve with a serving of your favourite crackers or a nice bread to dip into it. If just having 1 cup, I recommend serving with a sandwich or salad. 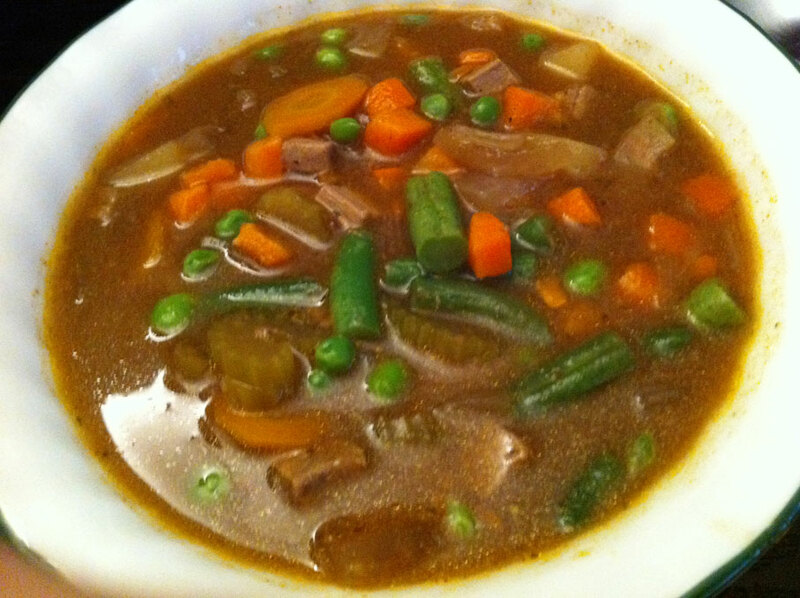 This entry was posted in Carb-friendly foods, comfort food, crockpot, dinner, low sodium, lower sodium, Lunch, one-pot-wonders, recipe, soups and tagged bay leaf, bay leaves, beef, black pepper, carrots, celery, cumin, curry powder, eye of round roast, frozen vegetables, garlic, ground cumin, Mrs Dash, mrs. dash table blend, onions, paprika, pepper, potatoes, roast, roast rub, water, worcestershire, worcestershire sauce. Bookmark the permalink.